The Rev. 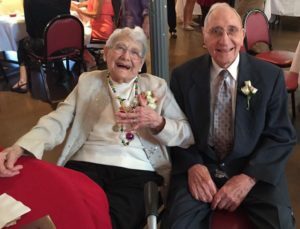 Dr. Richard H. Meyer (or “Pedo” as he is affectionately known) and Lois celebrated their 70th wedding anniversary on July 30th in a worship service at St. Paul (Port & Burgundy) in New Orleans. Their four children celebrated with them. Rev. Adam Cooper officiated. A reception followed in which many, many warm memories of the couple’s forty-six years in New Orleans quickly filled the church’s basement. Many present wanted their pictures taken with them. For a while, it looked like the paparazzi surrounded them! 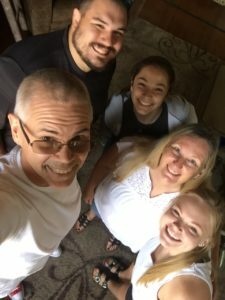 Pedo and Lois came to New Orleans from Japan where they served as missionaries for 23 years. They were called to two congregations in the New Orleans area: St. Paul (1971-1978) and Prince of Peace (September 1988 to August 1994). Pedo also served as Southern District President from 1978 to 1988. Both Pedo and Lois are known for their gentle and kind spirits. Someone commented, “You can see the light of Jesus in their eyes.” This light directed many to know God’s love. On August 1st they flew to Massachusetts to live near two of their children. If you’d like their address, contact Sabine Laird at the District Office – s.laird@southernlcms.org. This August, we celebrate 11 years of service at Camp Restore – New Orleans. In that time, we’ve been blessed to host over 30,000 volunteers from all 50 states and more than 30 countries, including hundreds of local volunteers and nearby neighbors from across the Southern District. Baton Rouge Lutheran School (BRLS) and Trinity Lutheran Church (TLC), 60-year members of the Baton Rouge community, announce the arrival of a new principal–its first in nearly 30 years and only the 4th in the school’s history. 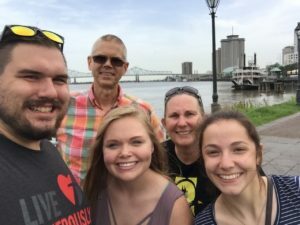 Southern District DCEs welcomed Kenzie Woltemath, DCE intern at Trinity in Baton Rouge, with a day in New Orleans. Joining the festivities were DCE Curtis Wiese of Good Shepherd (Shalimar), Nick Butcher of Trinity (Baton Rouge), and Zeal Beal of St. Paul (New Orleans), along with Concordia-Seward DCE student and summer Lutheran Young Adult Corp participant, Alex Lillis. St. Mark’s Lutheran Church in Elberta, AL, was thankful to have a successful VBS in June that reached many children in the community, in addition to the church’s children. On July 9th Good Shepherd Lutheran Church in Panama City, FL, celebrated the 25th anniversary of their pastor’s ordination.